I am so friggin' excited for this. I'm presenting at PechaKucha Night in Portsmouth on Friday 9/20! Cool, you say, but what's PechaKucha Night? Pronounced "pet-cha-ku-cha," PKN began in Tokyo in 2003 as an event for young architects to network and showcase their work for a public audience. The concept was simple - speakers present their information in 20 slides, 20 seconds each, in a fun, thought-provoking space. The event was so successful, the presentation format so novel, that the idea spread to other cities across the globe. Now, these lively, informal gatherings enable creative people of all ages and experience levels to get together to share their stories in this innovative, concise 20x20 format. And it's not just for architects. It's for the 5-year-old girl displaying her artwork for the first time. It's for the 69-year-old grandmother showing off her wedding cake creations. It's for the 23-year-old college grad completing his first project in the real world. It's for you. It's for me. Real people who can't get their work into a magazine or publication, but have interesting, life-altering stories, ideas, holiday pictures, or bottle cap collections to share. PKN celebrates it's 10th anniversary in 2013, and over 500 cities will be participating this year on 9/20. 1 Night. 100s Cities. 1000s Presentations. Globally. I'm so proud Portsmouth is one of these cities! 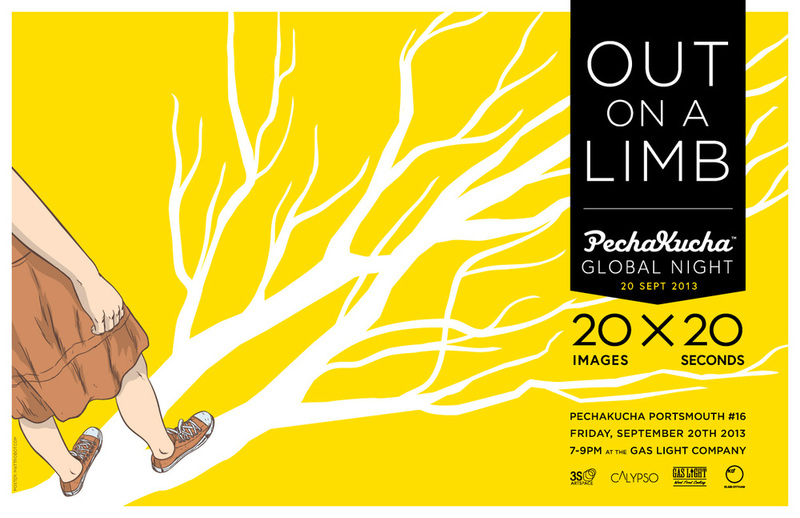 The theme for Portsmouth's PechaKucha Night is "Out on a Limb." You can click on the picture above to read more about the event, but in a nutshell, presenters will be telling stories of profoundly discomforting situations, how they got there, and how they survived. My talk is called "The Story of My Story: Confessions of a Self-Published Author," and I invite you to come listen to my story, along with the stories of my fellow presenters from the Seacoast area who are sure to amaze. Click here to read the Foster's article covering the event. Click here for PechaKucha's website to learn more about this fascinating program, to experience archived presentations from around the world, and find out about the upcoming event this month!